Vancouver author Sarah Ellis is well-known for her books for young adults and intermediate readers. 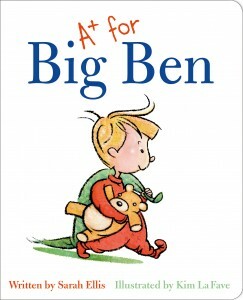 In A+ for Big Ben (Pajama Press, $10, board book) she has written a delightful story for youngest readers (ages 2-5)…. Ben is too small for most of the things older sister Robin and older brother Joe enjoy. Too small for school, too small for swimming strokes or reading the menu in a restaurant. Even too small to see out the window in the car. The sensitivity of his siblings helps lift Ben out of the funk he is in. The pair create a report card for Ben, complete with letter grades and comments. The assessment? It’s an A+ for Ben in all of the special talents he contributes to the family: feeding the cat, shoe tying, tooth brushing and making family members laugh. This delightful short book perfectly encapsulates the trials and tribulations of being the baby of the family, all the while showing the special regard held toward him by the rest of the family.